Currently Minecraft PE contains 15 most popular translation (the new version includes 94 languages) but this is not the whole world, there is a huge variety of other languages. More Translations was created specifically for those players who do not want to translate the text into their native language. By installing this mod, you will see approximately 100 available languages, which contain almost all the names of blocks, items, mobs, and other elements of the game. Addon is easy to install and supports the latest version of the game. At the moment, it's Minecraft PE 1.0.5. Community members of Minecraft PC independently translated the text, thanks to this there is a huge number of supported languages, and among them there are artificial or comic translations. 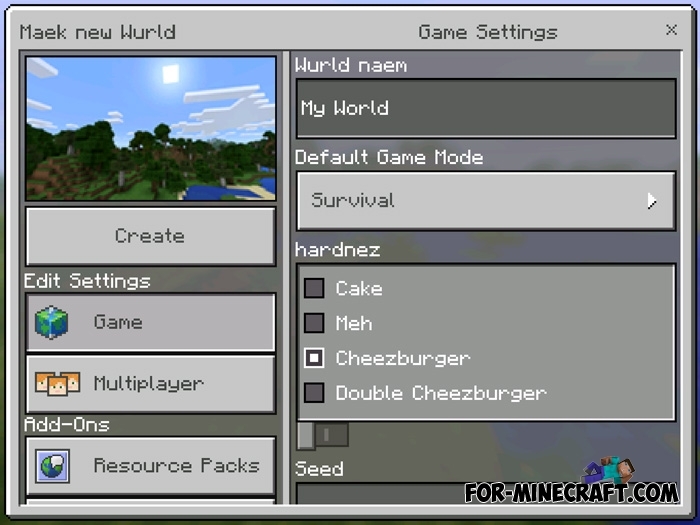 The translation of MCPE was carried out by a third-party organization and therefore in this version of the game there are much fewer supported languages, and existing translations are different from translations of the Java version of Minecraft. At the same time, the existing translation of some messages and terms may differ significantly from the usual translation. One of the translators described the quality of the translation as "carried out without love for the game". After the release of Minecraft Pocket Edition 0.16.0 it became possible to add your own translations using resource packs so the creator did it. As a result, now everyone can get a translation from the Java-version of MC. How to change the language in MCPE? As before, just go to the game settings, and change the language on the one that you want. You will find the Dutch, Irish, Norwegian, Turkish and many other languages. Some parts of the game have not been translated, perhaps the author will fix it. How to install the More Translations for MCPE? Download the file and start the game. Activate the downloaded file in the game settings. Then restart the game and go to the settings again. I'm developer of this addon.